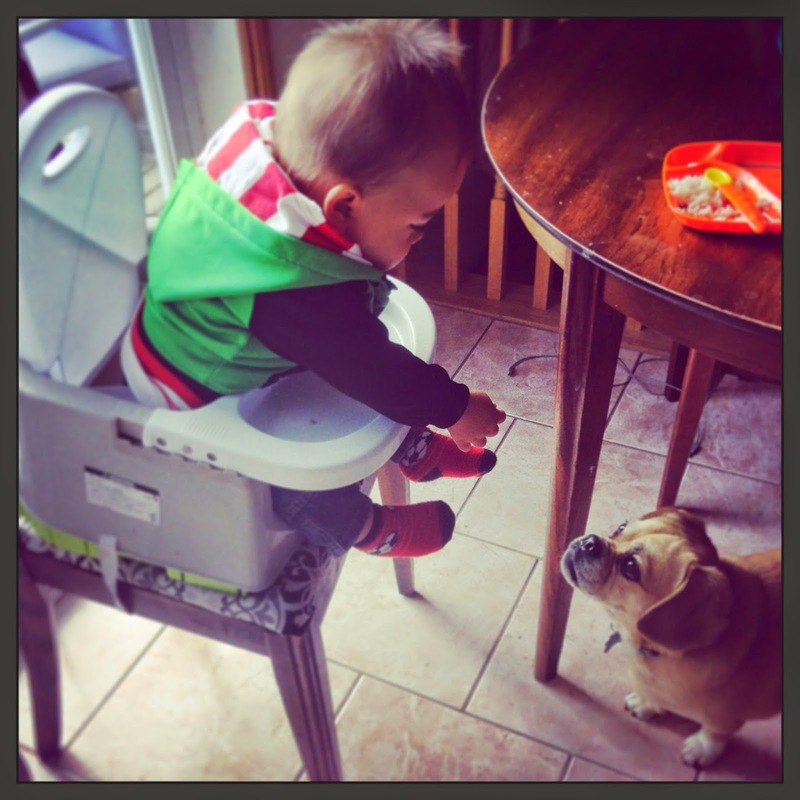 ROOKIE DAD LESSON LEARNED #105 - The dog will eat about half of your baby's meals - Dad Don't Lie - a Dad blog out of Halifax taking an honest look at the journey through parenthood. Meet my first born son, Kyrie. He's eleven months old. Also, meet my first born dog, Muggsy. He's a four-year old Puggle. Yep. Kyrie and Muggsy, sounds like a solid pair of NBA point guards, eh? Believe me, they like to dish out assists to each other in this household, especially in the kitchen. These two have become good friends or "brothers" as we like to call them. They play together, go for walks together, play in the sandbox together (my son plays in it, while the dog eats the sand) and they also....share meals together. Ever since we started Kyrie on the independent feeding phase, Muggsy has been the recipient of a lot of food scraps hitting the kitchen floor. I'm sure this is a very common occurrence when a baby and dog cohabitate, however, I am a rookie, experiencing it for the first time. Every morning when my son wakes up and has his breakfast, we normally give him some cereal, pieces of toast or a muffin, fruit and a cup of milk. On most days, Muggsy manages to eat about 90% of that meal. How does he get it? Kyrie makes it happen, either by throwing the food off of his plate or just handing Muggsy the food directly. They both really enjoy this game.The dog politely sits on the floor by his high chair, gives Kyrie those puppy dog eyes and the occasional whine... and Kyrie proceeds to throw him a snack. When we first got Muggsy as a puppy four years ago, we took him to obedience classes and we were pretty strict with the 'no feeding at the dinner table' rule. He's always been on diet of dog food (no human food) and occasional dog treats for good behaviour. But now that we have a young baby in the house, those rules went slightly to the wayside, and Muggsy is getting his fair share of human food at the dinner table. Now, we're in the process of trying to correct the behaviour. Kyrie's eleven months now and he's already learning new behaviours and understanding words when we say them. I'm trying to get him to learn the word "No" whenever he motions passing his food to Muggsy. But Kyrie is pretty slick. He'll be going about his business eating his breakfast...he'll then stop for a second, gives me a big smile and then looks for my eye contact. As I smile back at him, little do I know that he has his hand lowered to his side while Muggsy grabs that piece of toast. It's a classic no-look pass, and I don't even see it coming. Kyrie is a point guard in the making. I've got a lot to learn. I've got to learn to get one step ahead of my baby who's getting smarter day by day. I'll continue my attempts to curb this behaviour as I battle through my exploits as a rookie dad but I see this Kyrie-Muggsy duo continuing to reek havoc at the dinner table in the years to come. Baby/Dog parents, any tips would be appreciated, so send them my way.